Madison Heights, Mich. — DME has increased its stock of DIN metric components by 40 percent, giving moldmakers more access to North American-style products supported with same-day shipping. The expansion is designed to accommodate an increased demand from North American moldmakers who want DIN metric dimensions. The component line features metric measurements with a familiar North American design. “This expanded capacity will help us deliver on our promise to supply moldmakers with the tools they need, when they need them,” said John Harding, Manager, Global Sourcing. Bronze-Plated Wear Plates – Manufactured with a long-lasting wear surface for bronze-plated molds requiring slides, cams or flat surfaces where frictional wear is a factor. Self-Lubricating L-Gibs – Featuring a long-lasting wear surface for high-production molds. L-Gibs are easy to machine and can be shaped to any configuration, requiring no special tools. Leader Pins – Metric Guide Pins are precision made of high-quality steel and are hardened and finished ground to close tolerances. 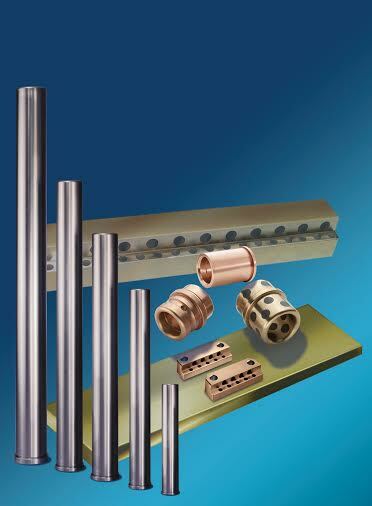 Bronze-Plated Shoulder Bushings, Ejection Bushings & Self-Lubricating Guided Ejection Bushings – Made of precision-ground steel with oil grooves and a true bushing surface that extends the full length of the bushing. Bronze bushings perform smoother and longer than plain steel, as lubricant is distributed throughout the bearing surface by the figure-eight oil groove system. 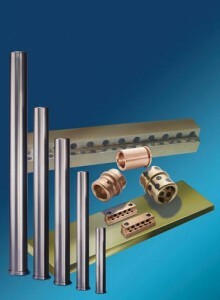 Customers can browse DME’s newly enhanced online catalog and order components 24 hours a day by visiting www.dme.net. DME Company is an essential mold technologies resource to customers worldwide. Through aggressive new product development, global product standardization and a powerful combination of in-house manufacturing centers of excellence and strategic global partnerships, DME is helping customers succeed in changing times. The company’s standard-setting, comprehensive product line — including hot runner systems; control systems; mold bases and components and mold making and molding supplies — is backed by expert technical service every step of the way. DME also manufactures and sells standard tooling for the die-casting industry.